Clearcut is the ultimate grater designed to grate quickly without clogging. Each individual blade is specifically designed to cut through food with precision allowing effortless and continuous grating without build-up. These stainless steel graters feature a large grating area, non-slip base and a comfortable brushed stainless steel handle with integral hanging hook. 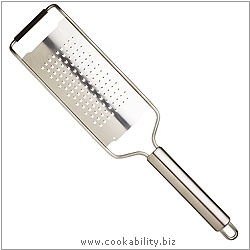 Fine grater works well for parmesan, nutmeg and lemon or orange zest.